Today I’m going to talk about riding the train around Europe. It’s so prevalent overseas, which is a total opposite of life here in the United States. If you are from the United States visiting Europe, then you definitely want to consider taking the train. Right now the US Dollar is very strong versus the Euro so Europe is an amazing deal. Which website do I use to purchase a Eurail ticket? 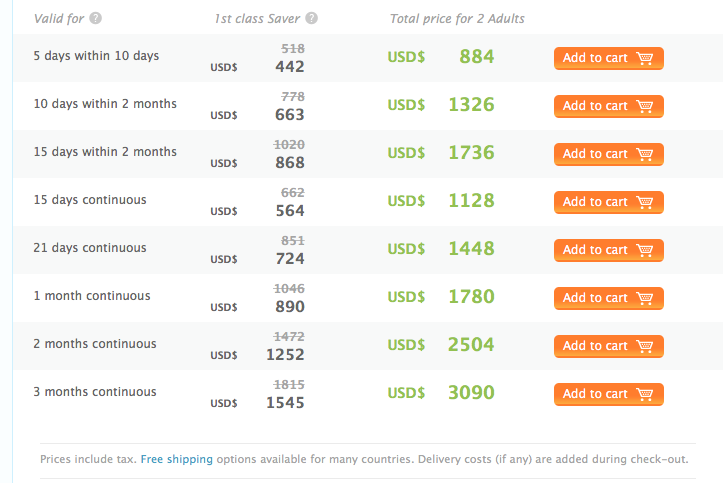 It seems like a helluva deal for two people to travel First Class on trains for 5 days out of 10 for $884. And it is. What they don’t tell you is that there is a limited number of Global Pass passengers on some of the more popular routes. And it’s a requirement to make reservations on some trains. On others, it’s optional yet recommended. And there is an additional charge to book. It wasn’t much more but it all adds up. I think we paid in the neighborhood of an additional $150 for our entire trip. I’ve talked to so many of my fellow service members who have traveled all around Europe this way. They all swear by it. The Eurail people have gotten smart and have located the ticket shipping centers here in the United States. So shipping is free to this country. The deliverables included our global passes, the tickets for the reservations and we even received a free telephone sim card for buying the passes when we did. We cannot wait. Posted in World TravelTagged Backpacking, Backpacking across Europe, Eurail, europe, france, germany, overseas travel, train travel, World TravelBookmark the permalink.